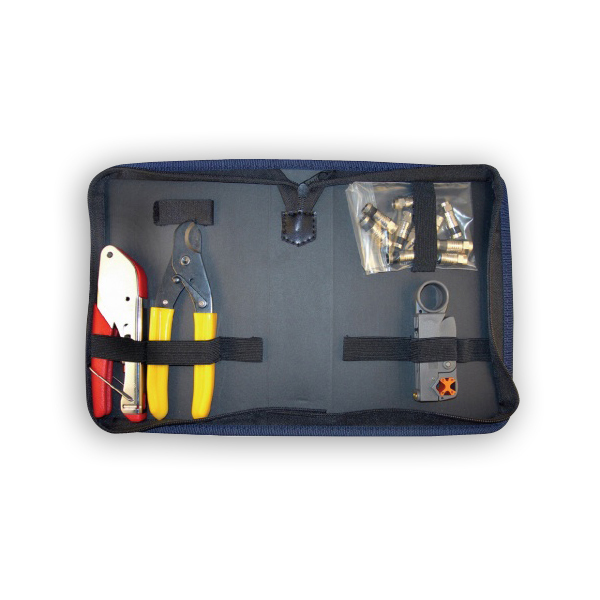 The SealSmart ZIP Kit-Basic provides all the tools required to terminate compression connectors from a variety of manufactures. Crimping adapters are included for BNC, F and RCA style connectors. Crimping height is adjustable for compatibility with most compression style connectors. Packaged in a rugged nylon zippered case. 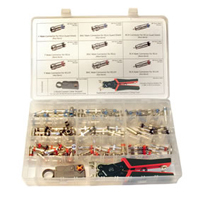 This termination kit is the perfect solution for CATV, Satellite TV, HDTV, Home Theater and Security installations. 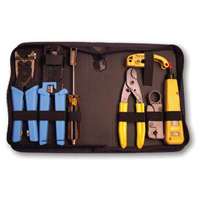 It includes all the tools to cut, strip, assemble and terminate SealSmart Compression Connectors. Kit provides the solution when working with coax for CATV, Satellite TV, HDTV, and Home Theater installations. It includes the tools to cut, strip, assemble and terminate F style SealSmart Compression Connectors. 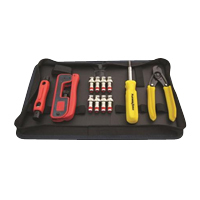 Kit features the patented EZ-RJ45® Crimp Tool and connectors for the simplest, fastest & highest performing installation of Cat 5/5e/6 data networks. 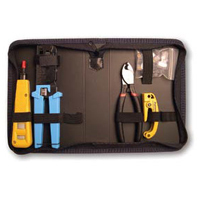 Kit is the perfect solution when working with coaxial cable for CCTV security installations. 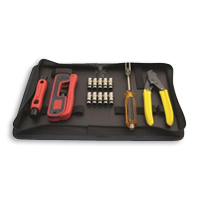 Includes all tools needed to cut, strip, assemble & terminate SealSmart compression connectors on RG59 coaxial cable. You won’t leave home without it! 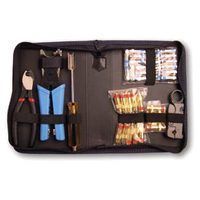 These kits include everything required for coaxial cable installations for CATV, Home Theater, Security & more. 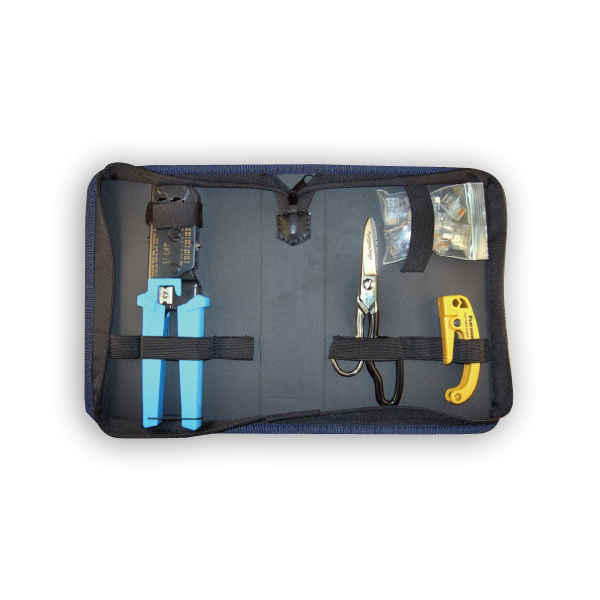 Kit includes a cable stripper, universal compression crimping tool, 120 SealSmart waterproof compression connectors and instruction sheets, packaged in a rugged, high impact plastic case. Color graphic insert assists in identifying, sorting and re-stocking all components. - 20 each of SealSmart connectors for RG59, RG6 & RG6 Quad cable. - 10 each of BNC SealSmart connectors for RG59, RG6 & RG6 Quad cable. - 10 each of RCA SealSmart connectors RG59, RG6 & RG6 Quad cable. - SealSmart Compression Crimp Tool. - Universal Coaxial Cable Stripper. - Set of laminated instruction sheets. - 9” X 14.5” compartmented plastic case. 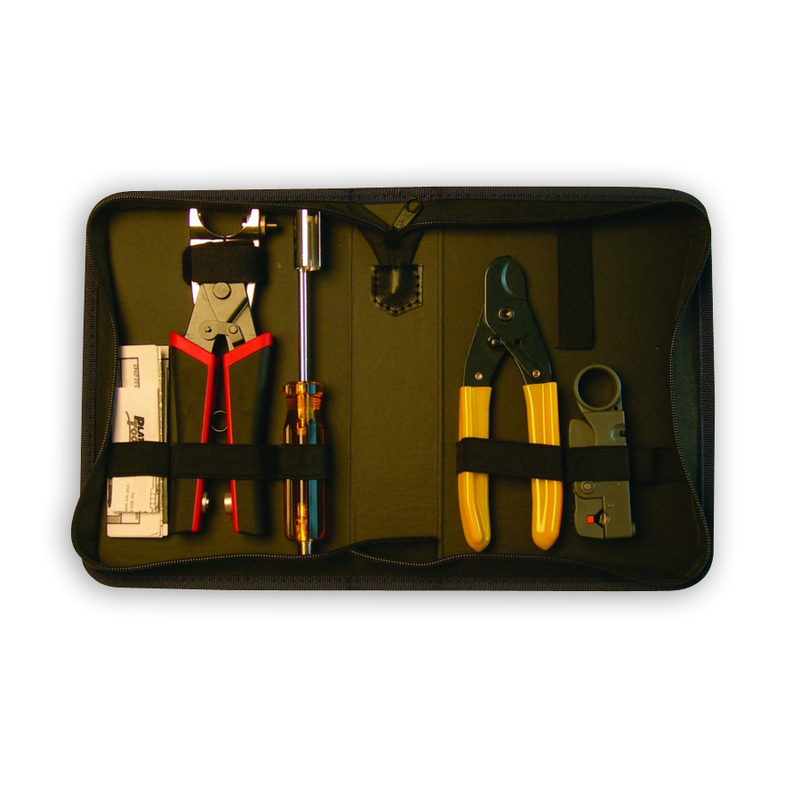 This termination kit provides all of the basic tools required for data communications, telephone and coaxial structured wiring installations. It features the patented EZ-RJ45® Crimp Tool and connectors for the simplest, fastest and highest performing installation of Category 5/5e data networks. Also includes the basic tools for CATV installations. Perfect for the complete Residential Structured Wiring installation. This termination kit is the perfect solution when working with twisted pair cable for telephone and data communications installations. It includes all the tools needed for cutting, stripping and terminating from the central closet to the desktop. Features the patented EZ-RJ45® Crimp Tool and connectors for the simplest, fastest & highest performing installation of Category 5/5e data networks. - Punchdown tool with 110 style blade. - BTP-6 Coax & Data Cable Cutter. - Cat 5 Cable Jacket Stripper. - 10 EZ-RJ45® Connectors and a nylon zippered case. 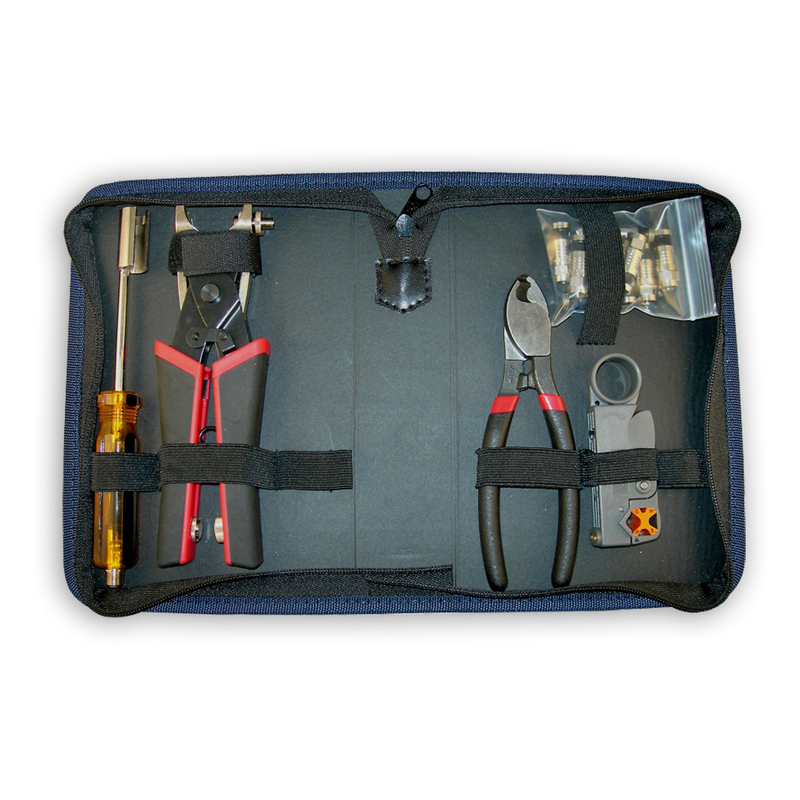 This termination kit is the perfect solution when working with coaxial cable for CATV, Satellite TV, HDTV, Home Theater and Security installations. 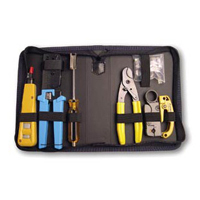 It features the SealSmart Compression Connector Crimp Tool and a selection of the most popular SealSmart compression connectors. Perfect for the Residential Structured Wiring installation. - F Connector Assembly/Removal Tool. - (20) F Connectors for RG6 Quad Shield. - (10) RCA Compression Connectors for RG59. - (4) BNC Compression Connectors for RG59 and a nylon zippered. 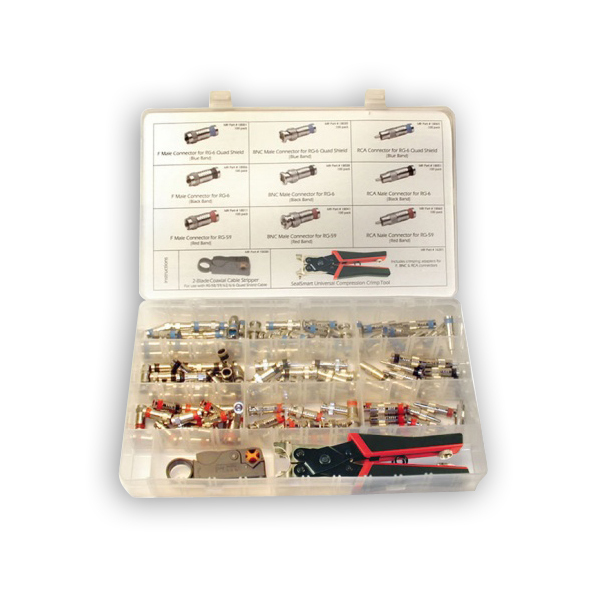 This kit includes all of the necessary tools for twisted pair and coaxial terminations. 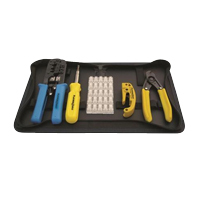 It features the patented EZRJ45® Crimp Tool and the SealSmart Compression Connector Crimp Tool. Cut, strip and terminate twisted pair and coaxial cables. Use for installing telephone and data communications (Cat 5, 5e & Cat 6), CATV, Satellite TV, HDTV, Home Theater and Security. Perfect for the Residential and Commercial Structured Wiring installation professional. - Coax and Round Wire Cable Cutter. - Punchdown Tool with 110 style blade and a nylon zippered case. Platinum Tools Premier Series Kits deliver a practical solution and offer the installer a balanced mix of popular products that are known to withstand even the toughest jobs. Time and time again. 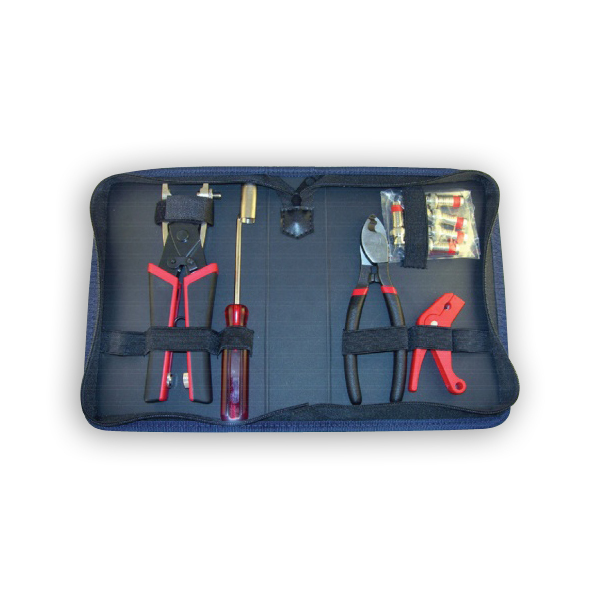 Platinum Tools Premier Series Kits deliver a practical solution and offer the installer a balanced mix of popular products that are known to withstand even the toughest jobs, time and time again.